Second only to my love of photography is my love of all things grape based! So what better opportunity to combine a few passions in one than a small job at one of the finest vineyards in the Stellenbosh region of South Africa, a short distance east of Cape Town. 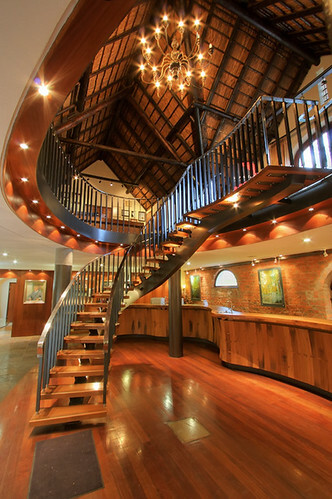 This composite image of the tasting room at Rustenberg Wines posed one or two problems in a single image. Firstly the height of the ceiling over two floors, with mixed lighting, daylight and a highly polished floor made for a very high dynamic range to capture. Needless to say I did this work before the enevitable wine tasting session – I take the sharpness of images seriously enough to delay sampling a glass of Rustenberg Brampton Viognier 2007 until the shot was in the can. In case you are interested Virgin Wines say: “Springtime perfumery, fresh ginger, peaches, apricots and honeysuckle. The palate is waxy and delicate yet with an underlying strength and focus. Aromas follow effortlessly onto the rich palate.” Mmmm!